Heart Slice is sugary pop perfection to satisfy your musical sweet tooth. As I mentioned in my Pop Hits Monday Mix, I was listening to a ton of top 40 earlier in the fall when I was spending a lot of time in my car driving between New York, New Jersey, and Maryland. I passed up the many mixes I had made over the last year in favor of listening to "Royals" and "Roar" played over and over again on the radio. Around this time I was also first introduced to Australian four-piece Go Violets, who caught my attention with their single "Josie". "Josie" is a motivational, don't-let-life-get-you-down anthem hidden beneath a thumping drumbeat juxtaposed with sweet harmonies and handclaps. It was like hearing the sunny, surfy pop answer to sometimes dreary (but equally lovable) UK indie pop. And for someone who was only listening to Lorde and Katy Perry, Go Violets first EP, Heart Slice, was the perfect amount of buoyant pop to satisfy my revived musical sweet tooth. Go Violets originally formed way back in 2009 with only two of their members, Phoebe and Alice, before blooming into a four-piece and adding bassist Harriette and drummer Ruby. They initially called themselves ^-.-^ before taking on the name Go Violets and posting a handful of songs on Bandcamp. 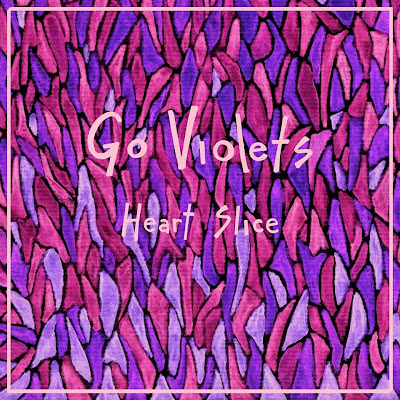 They officially released their debut EP in the beginning of October and called it Heart Slice, which is both adorable and a little gruesome. The six songs on Heart Slice are similar to "Josie" in that they're super catchy and basically impossible to get out of your head. I would find often myself humming the melody to opening track "Teenager" without even realizing what it was from. Each song is a delightful ear worm but unique in its own way, from the yearning lacing the lyrics of "Beside Me" to the quick lovesick guitar riffs in "Crazy". The EP ends on a high note with my personal favorite "Runner", which is a whirling track punctuated with echoes that literally feels like it's running laps around your brain. Heart Slice is sweet pop perfection from start to finish and makes me hope that one day I'll hear them on the radio. Listen to the rest of Heart Slice here.